Eager to start a postgraduate course this year but don’t know how to get there? 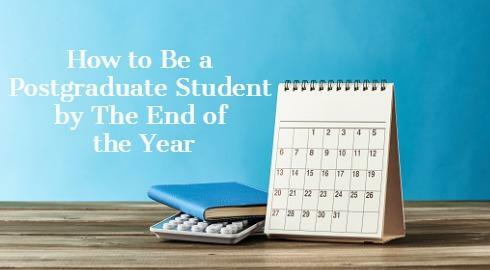 Here’s how to be a student by the end of the year. The key to getting on a postgraduate course quickly and efficiently is by assigning yourself set tasks each month. Do this and most of the hard work can be done in around three months, with little impact on your day-to-day life. Unlike your undergraduate years with set UCAS deadlines and start dates, postgraduate courses vary in both their application deadlines and academic year starts, depending on what and where you want to study. So, try and apply for a course at least six months before it starts, so if classes begin in September, make sure you’re putting the finishing touches to your application by March. Plus, check with the institution you want to study at for confirmed deadlines to be on the safe side. Whether you want to expand the knowledge from your undergraduate degree or start something completely brand-new, the first step to being a postgraduate student is not only figuring out which subject you want to study, but also which qualification. While being an undergraduate gave you a small selection of qualifications to choose from, (which all tended to last between 3-4 years), there’s a broad range of qualification types when it comes to postgraduate study, each offering a different teaching experience and outcome. Take these four weeks to explore not only what course you want to do, but why you want to study it. Do you want to expand your knowledge, use it to get ahead in your current job or go onto teach the subject you love learning so much about? How much time do you want to commit? Have you got a year to achieve this or are you looking to stay in university for longer than that? Try and confirm a few of these items each week. Answering these questions will massively help you pick the right course and type of qualification to go alongside it. PGCE (A postgraduate certificate in education takes around a year to complete). You also need to consider how you want to study too. For example, do you want to study full-time, part-time, at home or on campus? These seemingly small decisions will help you filter down your university options. Do you want to stay close to home? Remain at the same university as your undergraduate degree? Or what about studying abroad? Start considering all these options in order to help you find the right location for you. Over the next four weeks, order as many different prospectuses as you can, and if possible, try and attend open days for those you’re particularly taken with. While prospectuses can show you the best things about the university, attending a postgraduate open day will show the reality, and if those state of the art facilities they’re banging on about really are as modern and useful as they say. Plus, they provide the perfect opportunity to chat and ask questions to lecturers, students and general university staff, rather than talking to their email inbox. The trickiest and most time-consuming part is now upon you; writing the personal statement. This is your time to shine and sell your skills to the university admissions team. Tell them why you want to study your chosen subject, why you’d be a perfect fit for the course, showcase what you’re passionate about and what you hope to gain from it. Spend the first two weeks writing it (tips on personal statement writing can be found here) and then the next two weeks editing it, showing it to any friends and family you can get hold of for proof-reading purposes, and generally honing it into close as perfection as you can get. Then it’s time to hit send and await any offers…. The introduction of postgraduate loans has made further study more accessible than ever before. You can now apply to the student loans company for a loan of £10,000 on a non-means tested basis for Masters courses or up to £25,000 for PhDs. Just like your undergraduate degree, you don’t have to repay anything until you earn over £21,000 a year. You can also apply for a career development loan from the bank, which if successful, you could borrow between £300 - £10,000 from them. Offered at a reduced interest rate, the government pays interest while you are completing your programme, but once you complete the course you’ve got to start making regular repayments, regardless of your income. Although you don’t have to borrow money to afford a postgraduate. Many universities will offer scholarships and bursaries depending on your circumstances and strength of your application, so go to their website to find out if they’ll be able to financially help you too. If you’ve decided to study away from home, whether it’s 3 miles up the street or 33 hours on a plane, you’ll also need to sort out accommodation. Figure out your monthly budget for rent, whether you want to share, and if so, how many people and how close you want to be to the university, this will help when it comes to filtering out potential homes. Sites like SpareRoom, Housepals and Room Buddies list many rented houses every day so you’ll soon find the r ight room for you. Need some help finding a home or prefer to stay in university managed accommodation? Many universities offer rooms for just postgraduate students, while others have an accommodation team who will be able to help you find the right place at the best price, so you don’t have to do it alone.